Fire extinguishers play a valuable role in fire safety and are used by many people on a daily basis. As most people are aware Fire Extinguishers are used to put out small fires, quickly and safely. There are a wide variety of Fire Extinguishers used for a multitude of different purposes therefore it is essential that people understand fully how and when they are to be used. Not only is it important to know how to use a fire extinguisher (and which type of fire extinguisher to use) for our own safety, Fire Extinguisher training is a legal requirement in the UK under the Regulatory Reform (Fire Safety) Order 2005. 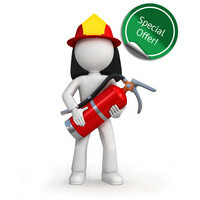 Discount Fire Supplies offers a variety of online, Institute of Fire Engineers approved, video based training courses (including fire extinguisher training) that complies with fire safety law helping you to stay safe and legal.